With the Adirondack Motor Enthusiast Club's (AMEC for short) Ice Racing season quickly coming to a close, I figured it was now or never to get myself to one of their frozen lakes in the Adirondack/Catskill region of New York. No longer having a running car of my own, I knew I wouldn't actually be able to field anything during a race, but my buddy Mathias Rios has been squirming to get some seat time on the ice all winter. It also just so happened that my parents were going away on an extended cruise and I would be the temporary caretaker of my father's 2015 Subaru WRX. Things were coming together very nicely. After completing a quick oil change on the WRX and swapping Mathias' Miata wheels for a chunky winter set, we set out on the three hour drive towards Albany. The drive from Central New Jersey went by rather quick, and I even made a few Subro friends on the way up. 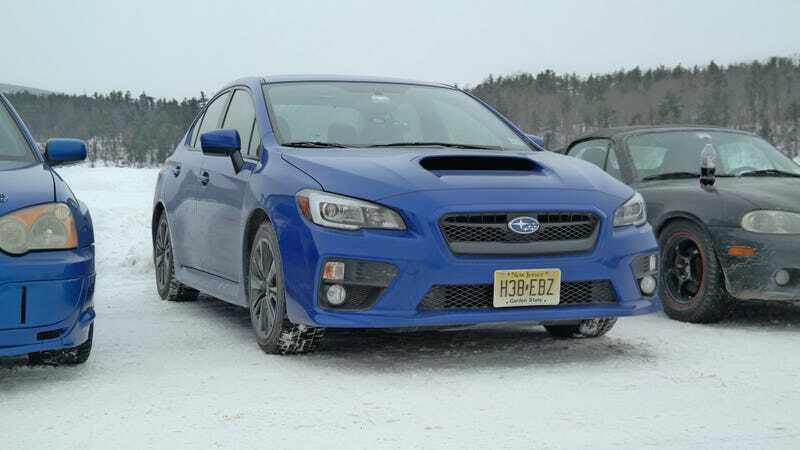 We encountered two other 2015 Subaru WRX's, and one 2015 Subaru WRX STi on the New York State Thruway. We stayed in Albany overnight, and the next morning Mathias and I made the short drive from our hotel to the frozen Warner Lake in East Berne, NY. When we arrived, we saw that there were already several ice racers prepped and ready to go for the first session of the day. After the first few practice sessions and races were completed, I met up with one of the race organizers to register and complete payment for my 20/20 session. I was pleasantly surprised when I found out there was a 50% discount for AMEC members, so the session only came out to be $10 dollars for 20 minutes of track time. $10 for 20 minutes straight of car control practice and open hooliganism? Where else can you do that? Most Rally-X events in my area have been at least $45 for what regularly amounts to (at most) 10 minutes of divided driving time. I always find that in Rally-X or Auto-X, you use the first three runs to get comfortable with the course, terrain, and your vehicle. In the end you only have two runs to actually work for a time. This is possibly the most annoying factor of Rally-X for me, and thankfully, it's not relevant with AMEC's 20/20 session. No, you're not going for a quick time and you're not competing with anyone. But you still have what feels like an eternity to continuously practice your skills on slippery terrain, while also attempting to be quick or just channel your inner Ken Block and practice that perfect oppositelock slide around a corner. Not to mention in a safe setting with little to no risk of damaging your car. And those are really the only reasons for why I've praised Rally-X. In the past, I've favored Rally-X because it is one of the only opportunities local to me in New York City where I can bring a car to its limits on low grip terrain while in a relatively safe setting with no possibility of injuring anyone or anything around me. Doing this while also testing my skills and practicing what I've learned from reading the different Jalopnik columns on winter car control has really helped improve my abilities. For me, AMEC's 20/20 session brings it to another level, that is, if you're not looking for the competition aspect. If you're interested in what actual ice racing is all about, head on over here. The 20/20 session is structured more like your typical track day rather than an Auto-X or Rally-X. You're not allowed to pass unless the driver waves you by. There are corner workers working the flags in case there are any dangers ahead, and to signal when the session is over. The main goal for the AMEC with the 20/20 session was to get more beginners out on the ice, and I believe this is the perfect way to go about it. Unfortunately the AMEC doesn't currently offer instructor rides for the 20/20 session, but you are more than welcome to fill your car up with passengers, as long as they all have helmets. It is also very likely that another Ice Racer would be willing to ride with you to share some insight about driving on the ice. My friend Brian Silvestro did just that during my session. If you are looking more for the competition aspect, once you feel comfortable with your skills and the car you're driving, the AMEC is more than happy to let you out on the ice and compete in some of the cheapest wheel to wheel racing in the area. All you really have to do is bring your helmet, your magnetic track numbers, and sign up for a membership and register for the race. You can find more information about the AMEC here. Cost: $20, $10 if AMEC member. AMEC membership is $20. Special thanks to the AMEC for hosting some very special events, and to my father for unknowingly letting me practice my car control skills in his car. Photo credit: Brian Silvestro, Mathias Rios.